Yahoo has acquired natural-language processing startup SkyPhrase, a company we covered in September after it emerged from stealth mode with a web service dedicated to analyzing Google Analytics and National Football League data. It’s a smart move for Yahoo (s yhoo), which appears dead set on on improving its large stable of services by making them smarter, a la Google and Microsoft. While its application was still online, SkyPhrase worked by letting users enter natural-language queries into a search bar (or a direct message on Twitter) and it returned results in the form of data. 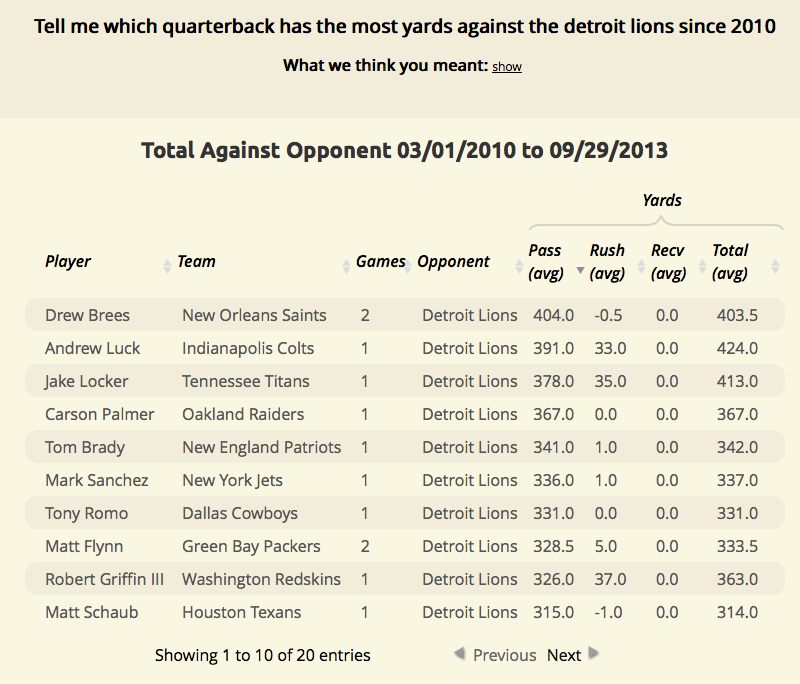 I tested out its NFL data service, and found it remarkably easy and useful, although obviously not perfect. It’s conceivable — although not guaranteed — that the SkyPhrase team could focus on porting its previous application to analyze the mountains of disparate data and content Yahoo has amassed over the years. Some way of easily searching through or even getting statistics on years worth of Yahoo news stories, Tumblr posts and Answers posts — possibly even your own email — could be very valuable. Considering the work two other Yahoo acquisitions — LookFlow and IQ Engines — are doing on computer vision, it’s very possible Flickr could be part of that mix, too. Whatever Yahoo has in mind for its NLP research, though, it can help the company in its fight to remain relevant. Its biggest rivals for web users’ attention and patronage — Google, Microsoft, Facebook — are all investing pretty heavily in research around NLP, computer vision and deep learning as methods to keep making their services smarter via better image recognition, speech recognition, translation, search and other capabilities. Even Dropbox, a potential thorn in Flickr’s side, has its own computer vision researchers in-house. As I noted in a recent feature on Yahoo’s demise over the past 10 years or so, the company built up a research team within its Yahoo Labs division only to see it scaled back by over the past couple years. New CEO Marissa Mayer has been working to rebuild the division — vowing to hire 50 Ph.D. researchers by the end of the year. All the brains in the world won’t ultimately make too big a difference if Yahoo can’t find a meaningful way to reach users, of course, but having them on board shows that Yahoo is serious about rebuilding its business. Feature image courtesy of Shutterstock user Andrea Danti.